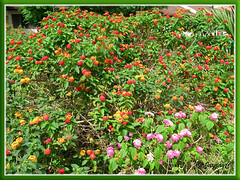 These Lantana camara bushes, blooming ‘endlessly’ so to speak, are such an attractant to butterflies and other insects! 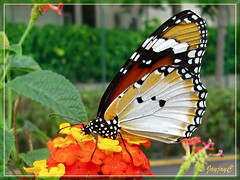 Butterflies just get swooned by the psychedelic colours and the irresistible scent of the flowers, hence providing great opportunities for us nature lovers who desire to photograph them. That joyful opportunity presented itself last December during a social visit to the St Francis Home for the Elderly in Cheras, Kuala Lumpur. 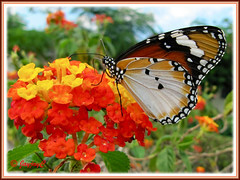 I had a truly enjoyable time ‘dancing’ around with the butterflies that came visiting the gorgeous Lantana bushes. Delighted to have photographed this attractive Danaus chrysippus, besides its other companion, the Tawny Coster. And, happy too for having put some smiles on the faces of a couple of nuns and elderly inmates who stood-by watching and were amused. The Plain Tiger or African Monarch/Queen as it’s commonly known, is a medium-sized butterfly with a wing span of about 6-8 cm and a white-spotted black body. The upperside of its tawny-coloured wings are brighter and richer than the underside, with the apical half of the forewings in black and splashed with a white band. The hindwing has a thin black edging that is dotted with a series of white spots and marked with 3 central black spots. Ahah, so our featured Plain Tiger here is a female, after all, without the significant scent pouch as described above. Then, calling her the African Queen, the other common name for Danaus chrysippus is more appropriate, don’t you think so? A very fast flier that had me going around in circles on that bright and hot afternoon and whose appetite for Lantanas seemed insatiable! Besides Lantanas, the Plain Tiger favours flowers of Jatropha, Zinnias, Marigolds, Sunflowers, Bachelor’s Buttons, to name a few. Unpalatable to birds and predators alike as the alkaloids in its body cause vomiting when ingested. Also, as defence, it exudes a smelly and nauseating liquid that taste horribly when attacked. Distribution range: A very common butterfly that is widely distributed, extending from Africa and southern Europe, and eastwards to Asia via Sri Lanka, India, and Myanmar to China and Sulawesi. Habitat: Open country, scrub jungle, grassland, gardens, coastal dunes, arid and dry areas, etc. and even seen on high mountains up to 9,000 ft.
Hostplant(s): The larvae feed on plants from several families, such as the Apocynaceae, Plumbaginaceae, Convolvulaceae, Moraceae, Euphorbiaceae and many others (check wikipedia’s link below for detailed listing). Favourite hostplants are Calotropis gigantea and Asclepias curassavica. 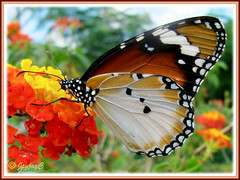 Check out the amazing photo set of the life-cycle of Danaus chrysippus (Plain Tiger) by Somnath Pal Das at Flickr.com. Enjoy!